Thanks to Richard's nifty etch bits, my Britannia is back together in its improved form. The wheel weights were added and the wheels painted (Tamiya Nato Black if you're intersted). Then all the gears and chassis bits were checked to function with the replacement coupling rods being sloppy enough to avoid hindering the gears. The connecting rods have huge ends and we had the idea to cut these off and splice on closer to scale big ends (bottom row in this picture). The original parts are on the left, replacements on the right. 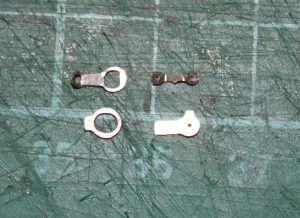 The return cranks are also much smaller shown in the top row. So after several bouts of dismantling, fettling and re-fitting the Brit has been re-wheeled, re-rodded, renumbered and renamed and looks much more becoming. After the completion of my Duke named Mercury, I decided to call the Britannia the same name. This was a Western Region machine and it didn't have the replacement smoke deflectors, so was a good choice all round. Cabside number transfers and new etched nameplates were from Fox. So the front bogie is Richard's etch with Association wheels, the drivers are Association, while the rear truck and tender wheels are self-turned on the lathe. They are mostly hidden so the slightly thicker treads won't be noticed. I may well change the tender wheels when Association spoked wheels with the extended axles become available. So here we have a picture of the completed model on Llangerisech, well over weight for the line, but this is where Rule One applies. Like the Blue Pullman, and the Western (currently being re-named and re-numbered as well to become Western Explorer), I had the OO versions as a kid. 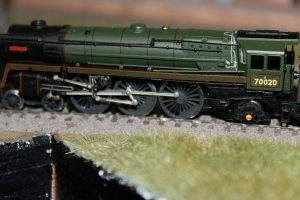 In fact, along with the 3MT tank and the HST, I have now pretty much got everything from my childhood replicated in much finer 2mm form now. So here we have the finished article. The signalman with the tablet pouch and hoop is the delightful item from Modelu. I can even claim that the 3D printed people are Cambrian!